This is a knitting pattern for a hat, with a couple different versions. When making this hat, in either the fitted cloche stockinette style, or the oversized slouchy garter stitch style, you’ll never break your yarn, you’ll never pick up stitches, and when you’re done, you’re done, no sewing or any other finishing steps! It’s a bit like knitting magic (but really, it’s just simple short rows, increases, and decreases). 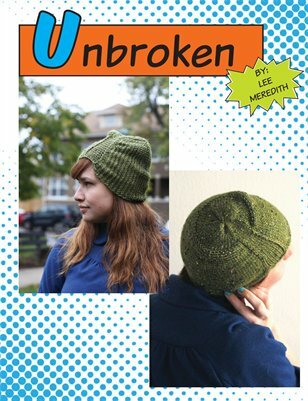 Another thing I love about this design is that it starts sideways around the head, so if you want to modify it to any yarn weight and size it custom fit to your head, you just try it on as you knit, to get a perfect fit – full detailed modification notes are included at the end! See the Unbroken page on leethalknits.com or on ravelry.com for photos and more details about the pattern.